Also available in Single Washer Pan sizes and custom sizes too! Fits ALL brands of washers & dryers with pedestal drawers or without, including LG, Whirlpool, Samsung, Maytag, Frigidaire, Electrolux, GE and more. WHAT MAKES OUR PANS THE BEST? After extensive research, we chose a special blend of unbreakable polyethylene plastics (similar to those used in making industrial cement drums) that is thick, UV-ray protected and will never break when stepped on. The pan is tough and UNBREAKABLE with a true lifelong durability. These pans never have to be replaced. We stand by our washer pans as being the best pans made. That’s why the patented DRIPTITE Combo, Single and Stackable Pans carry a 10 Year NoBreak NoCrack Warranty. The Combo, Single and Stackable pans, designed for all front-loading or side-by-side washers and dryers, meet all building code and inspection requirements in the US. We use the same materials on our Single and Stackable Washer Dryer Pans™ which are also UNBREAKABLE and just as tough. Our lifelong washer pans are designed to fit all side-by-side single or stackable front-loading washer and dryers with pedestal drawers or without. 10 Year NoBreak NoCrack Warranty. These pans never have to be replaced. 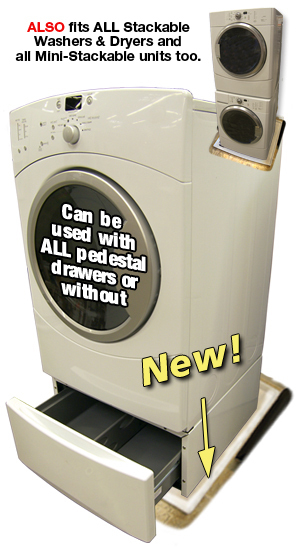 Ideal for high-rise condos and apartments, apartment buildings, homes and anyplace that uses stackable washer & dryers and single washing machines. Limited time special - anywhere in the U.S.! The Slide n' Fit Sink & Vanity Base Protector™ is manufactured out of styrene making it both flexible and extremely durable while also mold resistant. It has been specially designed to fit most all standard and custom kitchen and bathroom cabinets including island sink cabinetry. Protected by issued and pending patents. *Limited 1 Year Warranty. 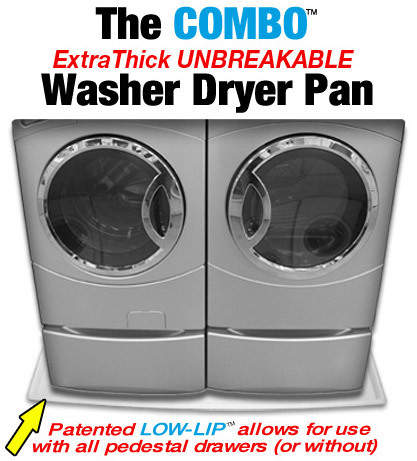 DRIPTITE Combo and Single Washer Pans carry an unmatched 10-Year NoBreak NoCrack Warranty. We are 100% confident that the special blend of materials we use to make our washer pans will not break or crack or crush under even the toughest conditions. We wanted to produce the absolute best pans possible so that you would never have to replace them. Just put em' in and forget em'. We are proud to say that of the many washer pans we have sold all across the U.S. - we have never had to replace one yet. You can trust the DRIPTITE name. Just look for the ToughGuy logo. Made in U.S.A.
DRIPTITE was established in July of 2002. Frank Carter, a plumbing contractor/sub-contractor with over eighteen years of experience in the residential and commercial housing development industry designed and market tested the first prototype of the DRIPTITE Sink and Vanity Base Protector. Shortly after, US patents were filed and Mr. Carter continued on with his research and development. 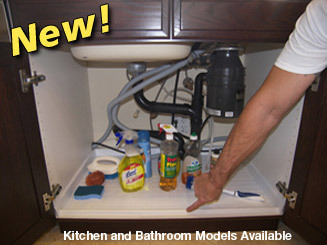 To date, DRIPTITE now has five patented products being sold in the market place: The Combination Washer & Dryer Pan, The Single Washing Machine Pan, The Slide n' Fit Sink & Vanity Base Protector, The Sink & Vanity Base Protector OEM version, The Disposable Sink & Vanity Base Protector, and the Plumbers (Sink & Vanity Base Protector) Rubber Roll-Up Mat.